Minister Simon Harris is set to bring the general scheme of legislation to Cabinet tomorrow. Health Minister Simon Harris will propose a bill that legislates for abortion up to 12 weeks. 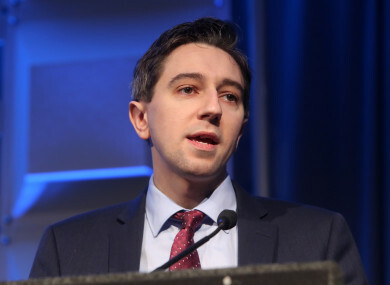 MINISTER FOR HEALTH Simon Harris is set to bring the general scheme of legislation to Cabinet tomorrow on what would be brought in if the Eighth Amendment is repealed. An upcoming referendum will ask the electorate if they want to repeal or retain the amendment, which recognises the equal right to life of the mother and the unborn. The government has already signalled that, if repealed, legislation would be introduced to allow for abortion up to 12 weeks of pregnancy. The general scheme that Harris is bringing to Cabinet is understood to be in line with the policy paper brought to Cabinet earlier this month. It is set to propose to make terminations lawful where an appropriate medical practitioner has certified that the pregnancy has not exceeded 12 weeks. In cases were there is a risk to the life, or of serious harm to the health, of a woman termination would not be lawful beyond viability. The viability of a foetus would be assessed and agreed by two doctors, one of whom would be an obstetrician or gynaecologist. If viability is established and the pregnancy is ended on health grounds then it will be done through early delivery, with a full medical team on hand. Minister Harris is also set to bring to Cabinet a package of measures aimed at reducing crisis pregnancy in Ireland, through increased access to obstetric care and counselling, and contraception. Read: How many foreign groups are buying Facebook ads as part of the abortion referendum debate? Email “Here's what the legislation could look like if the Eighth is repealed”. Feedback on “Here's what the legislation could look like if the Eighth is repealed”.